It makes absolutely no sense to purchase an expensive PFD if you don't know how to keep your PFD safe. Take care of your PFD and your PFD will take care of you. The following are some helpful hints and tips to help you maintain your PFD. If you try to alter a PFD, the warrantee will not be valid. PFD's are manufactured to specifications for optimal safety. Adding hooks, pockets, etc. will hinder the PFD performance and might lead to a disaster. Don't leave a PFD in direct sunlight for long periods of time. Do not dry the PFD in the sun. The heat and the sun will weaken the PFD. Don't dry a PFD using a dryer, a heater, a radiator or any other heat source. Always rinse a PFD in fresh water after use and especially if the PFD has been in salt water. Never leave a PFD in a damp place with no air circulation. Never leave a damp PFD in a plastic sealed bag. Also store a PFD in a well ventilated area. Always make sure that all snaps, hooks, pockets, tightening latches work properly. Always make sure there are no tears in the fabric. Always jump in the water about twice a year to make sure you float wearing the PFD. Always unload the pockets, take the knife off, etc. when washing the PFD. Always spray the PFD with a UV protectant spray at least two or three times a year. Don't leave the PFD at the bottom of a heavy pile of kayaking gear as the foam will lose buoyancy. Always hang the PFD on a wide hanger to drip dry after washing. Make sure the PFD has no mildew. 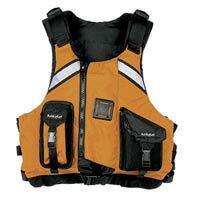 Realize that all PFD's will deteriorate over time and all will need replacing. Just realize when it is time to replace a PFD as this is the most important kayaking gear. Have fun paddling and don't forget to take care of your PFD when you return from your paddle.